Portsmouth, NH – In October of 2006, construction cranes lined the Newcastle Ave. causeway in Portsmouth, New Hampshire, poised and ready to haul 7000 square feet of excavated salt marsh peat blocks out of the tidal waters. The peat blocks would then be loaded onto trucks and transported half a mile away to South Mill Pond, where they would be carefully deposited back into the City’s tidal waters. This whole production was taking place because the Newcastle Ave. seawall and roadway were sinking into the sea and in sore need of repair, so the plan was for the peat to hang out in its new home while construction took place—about half of the peat would permanently remain at the new site while the other half would be returned to its birthplace later that winter. The Newcastle Ave. causeway before the project occurred in 2006—salt marshes and sagging sidewalks. “I’d never seen this type of project before. It’s really creative. For some reason, they decided to move the marsh,” said Peter Britz, Portsmouth’s Environmental Planner. The half mile journey: some of the salt marsh peat made South Mill Pond its permanent home, and today, a small, but healthy section of fringing marsh can be spotted near City Hall. Though the marsh’s journey was ultimately successful, unfortunately, the story of the moving marshes doesn’t end there. For as sea levels continue rising at faster rates due to climate change, these salt marshes have to try to keep up – building higher and moving inland. This is because salt marsh plants depend on a very specific amount of daily tidal flooding. The water carries with it sediments that marshes trap and build on top of, but too much water on a regular basis causes the plants to drown. And sea walls and other barriers behind the marshes can keep them from migrating inland to where they need to go to maintain that critical water balance. The peat moss survived its journey from the Newcastle Ave. construction site to its new home in South Mill Pond, only to face new pressure to move from rapidly rising seas. While employing cranes to physically move old marshes to new places may have been a novel idea in 2006, wetland mitigation projects are not uncommon in the Seacoast. State laws require construction projects and other activities that adversely impact wetlands to offset those impacts by restoring the same types of habitat in other places. Salt marshes are not only critical nursery habitat for species like the tasty New England lobster but are also stupendous at storing carbon, fantastic at keeping nitrogen and sediment pollution out of the water, and great at protecting people from storms because they hold excess flood waters. But, understandably, our Seacoast communities are going to need to repair their roadways and bridges from time to time, and sometimes they have to hurt salt marshes in the process. That’s where wetlands mitigation comes in. Salt marshes (in winter) at the Newcastle Ave. site protect property, people, and fish, alike. “In Portsmouth, we have seen a number of approaches where the project was able to meet the needs of both the City’s roadway infrastructure and the associated natural systems were taken into consideration and restored within the limits of the landscape,” said Steve Miller, who chairs the Portsmouth Conservation Commission. Prior to 2006, the half mile stretch along the Newcastle Avenue causeway was approaching unsafe conditions. 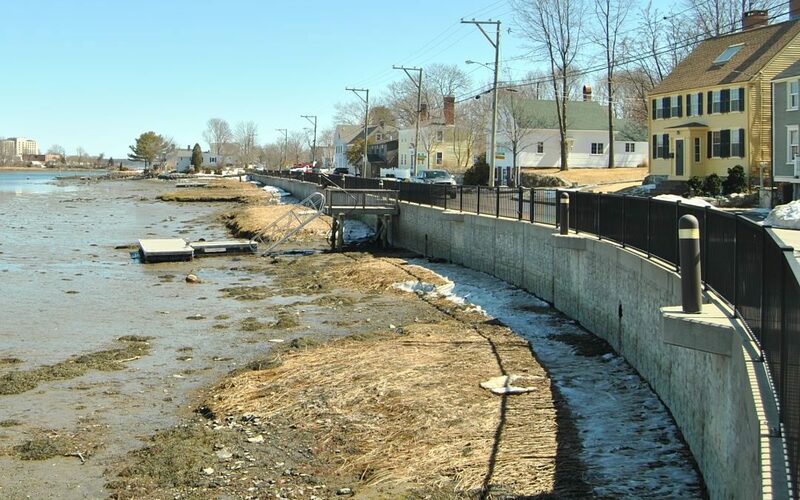 In order to be fixed, the footing along a 1000-foot stretch of the historic seawall lining the road needed to be replaced, which required digging up the marsh that sat in front of the wall. On top of the safety concerns, the roadway was not attractive or functional for pedestrians, so it got a little sprucing. Today, it’s hard to find a minute when someone isn’t running or strolling along the, now improved, Newcastle Ave. seawall stretch. After construction was completed, restoration experts moved some of the peat back and replanted the disturbed area along the road, hoping that it would reestablish over time. Five years of monitoring followed, and results show that at both sites, the marshes were doing very well, with an average of 97% plant cover by 2011. “Portsmouth highly values our remaining salt marsh systems. To lose any one marsh means increased impacts and cost to the City in the future,” said Miller. As scientists predict sea-level rise in New Hampshire between 2.0 and 6.6 feet by 2100, preserving the fringing marshes along our roadways will only get more difficult. Last year, experts at the New Hampshire Department of Fish and Game and the Great Bay National Estuarine Research Reserve ran some models to help us understand what sea-level rise means for the precious marshes around the Seacoast. Where would these marshes want to migrate? And where could they migrate? In the case of Newcastle Avenue, the second question is perhaps more important, because the seawall and the road that required moving the marshes by crane in 2006 are ironically the very things that will likely keep the marshes from moving where they need to move in the face of sea-level rise. While the marsh will want to migrate inland to where the road is, the seawall is a major barrier in its way. As long as pedestrians and cars want to use the road and residents want to live across the street, chances are the marsh won’t get its way. “Is this salt marsh still going to be here in the future? I don’t know. Probably not,” said Britz. So what can we do about that? Neither Britz nor Miller have the answer, because it’s not an easy question, but they do have some similar ideas. Find the places that will allow marshes to migrate and focus our conservation and restoration efforts there.